I thought maybe she drew a picture she wanted me to hang up but when I walked over to check it out, I saw something even better! 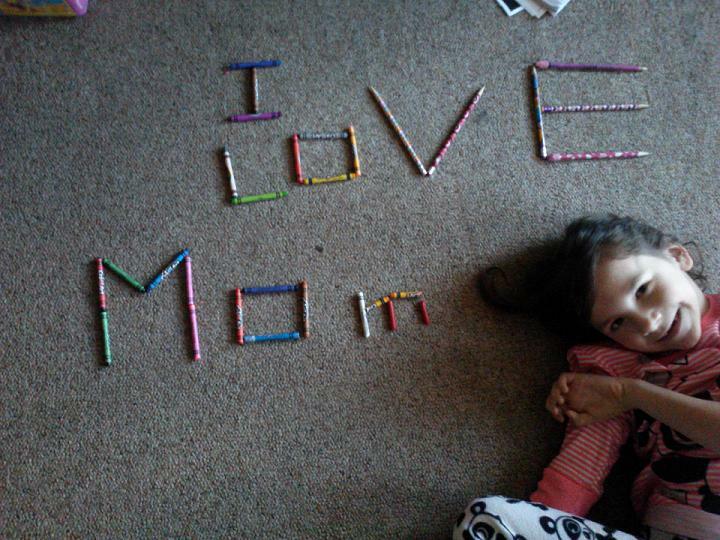 She used the crayons to spell a special message for me on the floor. She didn’t write on the floor at all and it made my day. She was so proud of her masterpiece she made for them. I love the creativity of children. She had some fun with crayons in more ways then coloring that day. I love her unique way of using crayons! And I hope that Google finds her picture. She's very creative! Thank you Ginny! She surprised me, I thought she was coloring 🙂 She does have a great imagination. Thank you OneMommy 🙂 Hopefully they will! I couldn't find an email address to email it to them so she asked me to put it on my blog for them! I love those sweet little moments that make a message house all worth while. I hope Google sees her master piece one day as well. This is a good way to meet other fellow bloggers and share. Please follow my link if you would like to accept and find out more! Thanks!